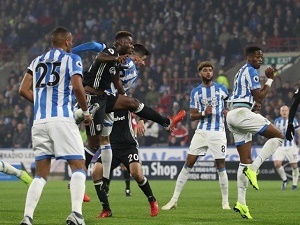 Timothy Fosu-Mensah’s first-half own goal gave Huddersfield a 1-0 home win against Fulham and their first Premier League victory of the season on Monday. Fosu-Mensah headed into his own net, under pressure from Town’s Christopher Schindler as Huddersfield halted an eight-game home run without a top-flight goal and moved above Fulham and Cardiff at the foot of the table. The Terriers’ winless league run stretched back to April — 14 league games in total — but manager David Wagner was able to celebrate on the night of his third anniversary in charge with a morale-boosting victory. Fulham’s fifth successive league defeat did little to ease the pressure on boss Slavisa Jokanovic, whose side’s own run without a league win was extended to eight matches. Huddersfield almost halted their barren spell in spectacular fashion when Philip Billing’s 30-yard thunderbolt struck the crossbar in the 15th minute. Steve Mounie headed Aaron Mooy’s cross tamely over soon after and Alex Pritchard’s brilliant effort from outside the area was expertly clawed away by Fulham goalkeeper Sergio Rico. But Huddersfield’s agonising wait for a goal at home was finally over in the 29th minute, making it 659 minutes in total.